Cyclists, like all athletes, need plenty of liquids. But beyond that basic tenet, things get murky fast — and for years, riders have heard conflicting reports about what, when and how much to drink. So we tapped our best resources, from the latest research to sports nutrition expert Monique Ryan, RD, author of Sports Nutrition for Endurance Athletes, to separate the facts from the hype. Here's what we found. For years cyclists have been told to drink enough on the bike so they weigh the same after the ride as they did beforehand. The truth is, your body can't absorb fluids as fast as it loses them, and not every ounce of weight is lost through sweat anyway. Replace about 75 percent of lost sweat during a long ride. "To do that, you need to know your sweat rate," says Ryan, who recently coached a heavy-sweating triathlete who routinely lost 40 ounces of fluid an hour. To determine your sweat rate, weigh yourself before and after a short ride. "An hour ride is a good indicator of what you're losing through sweat alone," Ryan says. 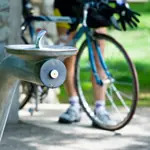 Guzzling gallons of fluids before a ride or race will do little more than send you searching for rest stops. Sip a 16-ounce sports drink an hour or two before you saddle up. That's enough time for your body to absorb what it needs and eliminate what it doesn't. Then take in about six to eight ounces (two to three gulps) every 15 to 20 minutes while you ride. Caffeine has long been demonized as a diuretic. On paper, that means it should lead to dehydration and heat stress, especially when you consider that it also raises your heart rate and increases your metabolism.